Thick nitrile gloves provide excellent comfort, protection and tear resistance The best defense offered by a disposable glove! These comfortable, disposable 12-mil thick nitrile gloves provide superior abrasion resistance and greater protection whether you need them for chemical splash protection or for painting, handling animals or doing mechanical work. 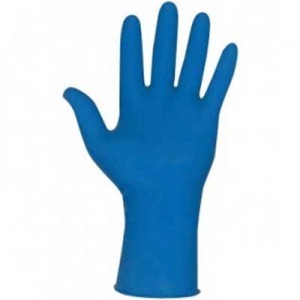 The thick blue nitrile material on gloves conforms to your hand without feeling too tight. Nitrile material tears when punctured so you know the glove is violated. Textured fingertips on thick nitrile gloves give you superior grip when working with small oily parts or other slippery items. Rolled cuffs are a big help when putting on or taking off. Lightly powdered for easy on and off. Latex-free material is recommended for people that are sensitive to (develop dermatitis from) latex rubber. Gloves are 12" in length and ambidextrous. Bag of 50 gloves. Imported. Specify size: S (8), M (9), L (10), XL (11) or 2XL (12) from the selection box above. See drop down box for sizes currently available. NOTE: To ensure proper fit order one size larger than your measurement.